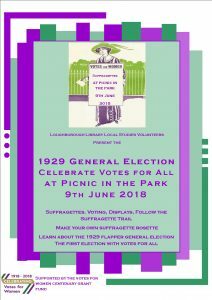 Lougborough Library Local Studies Volunteers will be staging a 1929 Flapper General Election at Picnic in the Park the first election when all women over 21 could vote. This s at Queens Park in Loughborough and is open from 11.00am to 4.30pm on June 9th 2018. Entry is free. Vote in the election, find out about the candidates, meet the suffragettes, make a suffragette rosette and find out all about how Women fought for the right to vote.